When it comes to cleaning your house, some chores are easy to overlook. We’re talking about the tops of windows, fan blades, baseboards and other high and low places where dirt and dust build up. Other important tasks are in plain sight but can escape even the most fastidious housekeeper’s attention: Your appliances. They need regular cleansing to eliminate germs and odors – and keep them running great. In addition to regular cleaning of crisper drawers and drips and spills, deep clean the fridge seasonally. Remove everything, discarding expired food. Starting at the top, clean and deodorize each shelf with a mix of warm water and baking soda (one tablespoon per gallon). Pull out drawers and wash thoroughly. Wipe down the inside walls, then do the same on the outside, paying special attention to handles. If you have an ice maker, change the water filter every six months or so (check your owner’s manual for details). If it’s a self-cleaning model, you can certainly take advantage of that feature. Unfortunately, that can be stinky and smoky – and you still have to wipe up the ash afterward. An alternative to harsh chemical cleaners is getting the job down naturally! Here’s how: Start by emptying the oven, including all racks. Mix a half cup of baking soda with a few tablespoons of water into a paste. Spread the paste over the interior, avoiding heating elements. Let it sit overnight. Then take a damp cloth and wipe out as much of the paste as you can. Use a non-metal spatula to scrape as needed. Next put some white vinegar in a spray bottle and spritz on any remaining baking soda residue, creating a foam. Wipe down with the damp cloth and repeat until the oven is clean and shiny. Take the plate out to wash. Wipe out the oven with an all-purpose cleaner or take a couple more minutes and do it naturally. Place a cup of water and a chopped-up lemon, or several tablespoons of vinegar, in a bowl and microwave to a boil (the window should steam). Let cool for 15 minutes before removing the bowl and wiping out the inside with a sponge. Run an empty load with hot water and a cup of white vinegar to sanitize the basin and wipe out germs. Special cleaning tablets are also available at most supermarkets, if you prefer. In addition to regular cleaning of the carafe, clean out the machine – decalcifying and preventing mold growth – by running a cycle of equal parts white vinegar and water. Let sit for 30 minutes, then run a second cycle of only water to eliminate the vinegar smell. Start by cleaning the filter (check the manual for info). Then run a cycle on the hot water setting with a cup of white vinegar on the top rack. Next, deodorize by sprinkling a cup of baking soda on the bottom of the tub and running a half-cycle on hot. Afterward, leave the dishwasher open for a few hours to air it out. To deodorize and clean away residue, drop in a cut-up lemon, a couple of tablespoons of salt and a few ice cubes, and turn on the disposal. 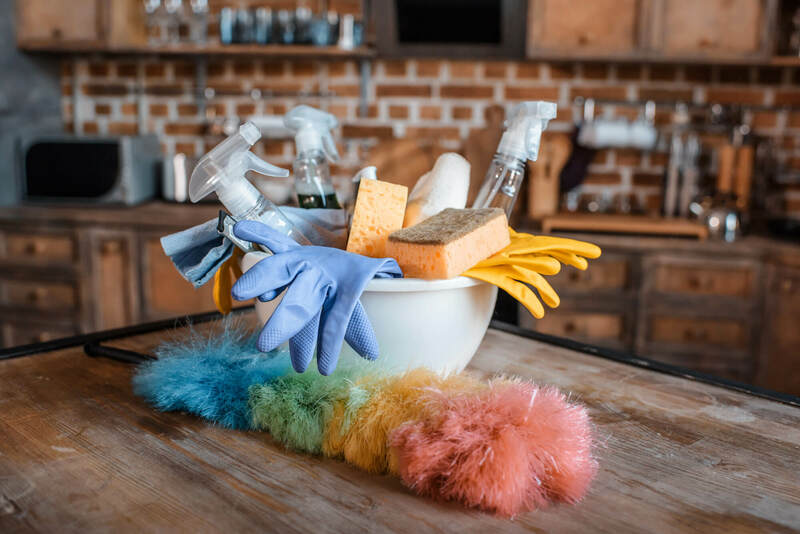 Once you have your appliances on a deep cleaning schedule, it’s relatively easy to add a few easy-to-miss chores to your regular housekeeping. Run a damp cloth over baseboards and use a feather duster or soft cloth on the top of windows, bookshelves, doors and door frames to eliminate dust. Mop under the fridge and dishwasher to clear away dust, dirt, and grime. Ceiling fan blades collect dust and dirt, especially if they’ve been idle for a while. Wipe them down with a damp cloth. Do the same with blinds. To prevent germs from spreading, remember to disinfect the TV remote, computer keyboard and mouse, phone, light switches, cabinet pulls, and door knobs. Rinse out and wipe down toothbrush holders regularly. If you have kids, remember to wipe down favorite toys, especially bath playthings that can attract mold. These simple tasks will ensure that you have a home in the Copperleaf Community that shines for your family and guests alike!